​Xylem’s Sanitaire Eco-lift retrievable aeration grid features an innovative design and utilizes high efficiency Sanitaire Gold Series and Silver Series II diffusers, reducing both the capital and life cycle costs associated with aeration systems. Fine bubble diffusers are much more efficient and reliable than both mechanical aerators and tubular membrane diffusers. 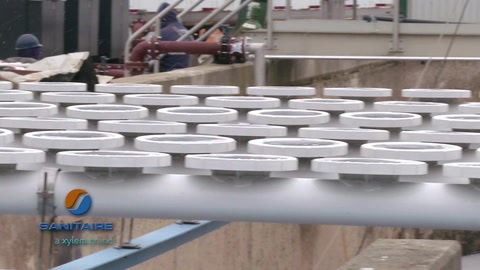 The Sanitaire Eco-lift retrievable aeration grid is designed with the diffusers mounted on structural frames which can be lifted out of the basin for easy inspection and maintenance without having to disrupt the wastewater treatment process. The grid is a cost-efficient alternative to constructing a parallel treatment train. ​The Eco-lift retrievable aeration grid uses a patent-pending ‘tube-in-tube’ design which requires significantly less steel as ballast to keep it under water than alternative products. 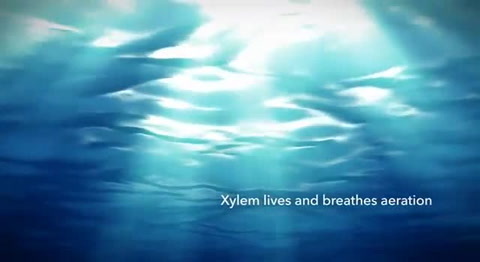 This lowers the cost of the product by up to 50%, compared to Xylem’s former designs, and results in higher and faster return on investment. In addition, Sanitaire Gold Series and Silver Series II diffusers offer the highest Oxygen Transfer Efficiency (OTE) and mechanical reliability when compared to tubular diffusers, mechanical aerators or other types of aeration systems, saving wastewater treatment plants millions of dollars over their life span. Suitable for both municipal and industrial wastewater applications, Xylem’s Eco-lift retrievable aeration grid frames are constructed of carbon steel I-beams or stainless steel square tubes which produce a more flexible and stronger structure than a frame constructed of concrete. This frame acts as ballast to keep the aeration grid down on the floor of the aeration basin. A standard aeration grid with innovative tube-in-tube design is then mounted on this steel structure. In applications where a retrievable grid is not required, the aeration grid is mounted onto the aeration tank floor. Two types of lifting mechanisms are available: a lifting cable arrangement with a central mast to retain the cables above the water line and keep the cables taut, or four tubular lifting arms connected to each other at a central location above water level with a ring attached on top to easily lift the grids.